While Health Coaching covers four core pillars: Exercise, Nutrition, Stress Management, and Sleep, I find nutrition to be the biggest focus for nearly all of my clients. I’m not surprised! Stocking up on healthy foods, cooking nutritious meals, and figuring out the better choice when ordering out take time. You go through phases of being on top of it all, but life gets in the way – work picks up, you move, travel, have a baby, etc. – and before you know it you’ve been eating out nearly every night and having the left overs for lunch. You feel sluggish, puffy, and drained. To make up for all of this you decide to be a meal prepping pro. You make a detailed plan for the week, spend hours pouring over recipes and grocery shopping, and even more time prepping all of your meals. It feels awesome! But the weekend rolls around and the thought of doing it again exhausts you. It’s too much. I’ve been there. I tried the intricate meal plans but felt overwhelmed. But I hated the feeling of scrambling to get dinner together each night, and spending money on a less-than-nutritious lunch was not where I wanted my paycheck going. Like you, I value my health and want to fuel my body right, but also don’t want to spend hours each week meticulously meal planning and prepping. I thought I was busy before I had my son, but as you mama’s know, once I became a mom my time became even more precious. 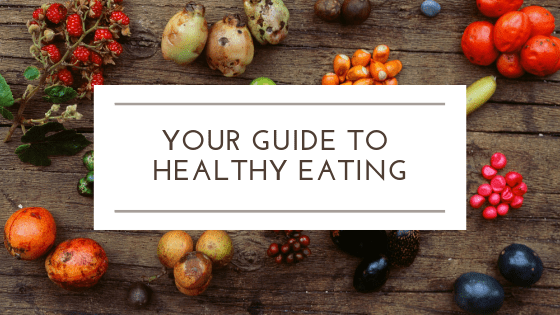 Healthy eating is still a top priority, but ensuring it happens takes strategy. Over the last few years I’ve come up with a system that works for me and adapts to what my week is like. 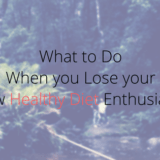 I use these strategies to maintain a healthy diet – with indulgences when they are wanted! – no matter what my life looks like. 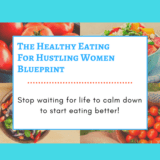 I’ve put all of these tips into one e-course; The Healthy Eating For Hustling Women Blueprint. 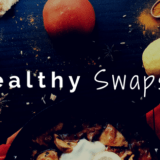 This course is your guide that simplifies healthy eating so you can get on with your day while fueling your body right. Each lesson contains a video with practical information and actionable steps, plus a variety of helpful links, homework, and downloads so you can implement the strategies right away. 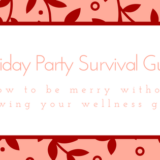 If you’ve tried following diets or meal plans but get frustrated after a couple weeks (or days!) and throw in the towel, this is the course for you. My tips and tricks give you small changes to make so you can eat better for a lifetime, not just a few weeks. Big results come from small changes. Are you ready to eat healthy long-term? Do you want a plan that adapts to your life? Even when things are crazy? Even when you’re on vacation? How would you feel if never used the work “diet” again? What if healthy eating felt natural? Start changing how you eat today! Click below to start NOW!